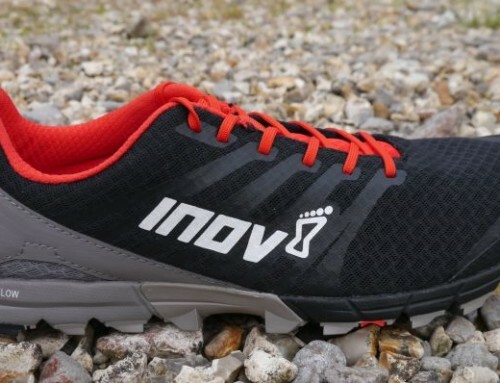 After 130 miles, it’s time for a (well overdue) review of the Inov-8 X-Claw 275 trail running shoe. I’ve used it on long and short runs on a variety of terrain, so have some useful insight to help you choose if this is the right trail weapon for you. 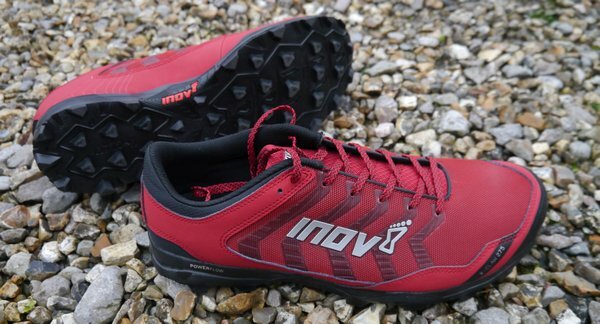 The X-Claw is for people that want loads of grip in terrible conditions, but want a bit more cushion, when compared to Inov-8’s more minimal X-Talons. It’s also quite splash proof, so if you are looking for something that sheds water a little, it might be an option. 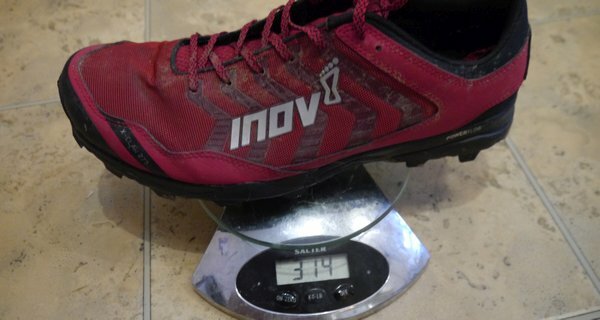 My size UK11.5 weigh 314g (the 275 in the name is for a much smaller size), so it’s still quite a light shoe for something with lugs this big. I’m 11.5 in most shoes, and this fitted just right on the length. 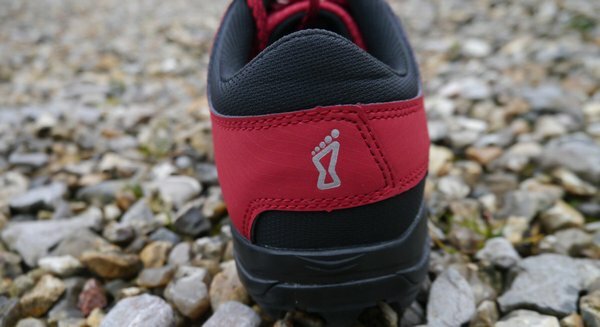 Let’s start with the outsole – the lugs on this are like flat-top pyramids sticking out of the bottom. 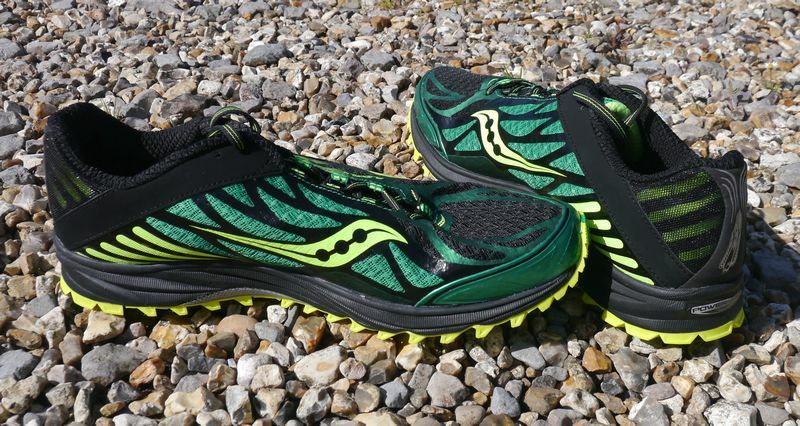 They are designed to give grip and shed mud. It’s pretty aggressive. The material is very sticky. 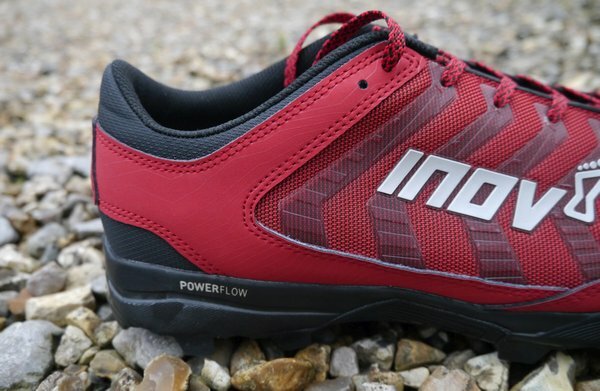 The forefoot has Inov-8’s Meta-flex grooves to let it flex naturally, letting your foot feel the ground properly. 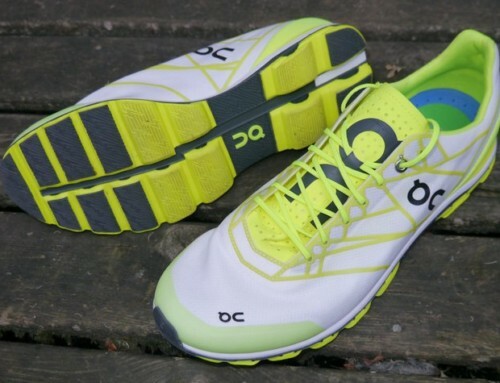 The cushion is soft and plenty thick enough for longer runs. 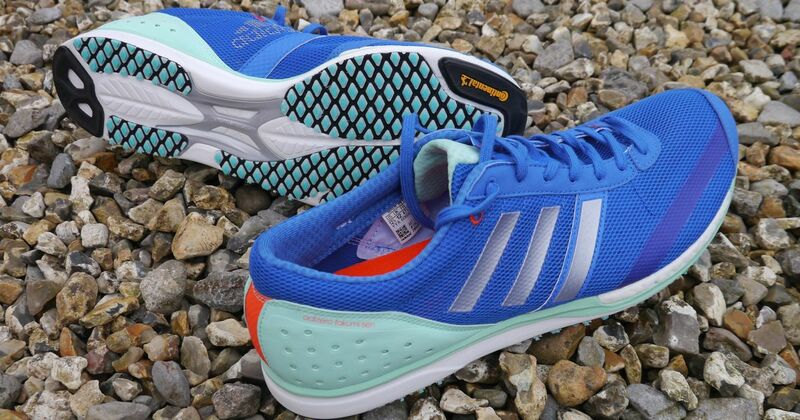 The main feature of the upper is the waterproof splash guard surrounding almost the whole base of the shoe. Don’t step underneath any water, because they only way for it to get out is at the heel, where a small mesh lets water drain. The rest of the upper is quite tightly woven mesh, so water tends to roll off it before soaking in. It’s not waterproof, but my socks stay dry longer than things like Peregrines in long wet grass. Two arrows on the back mean it’s a higher drop, in this case 8mm – useful to take the pressure off on the uphills. 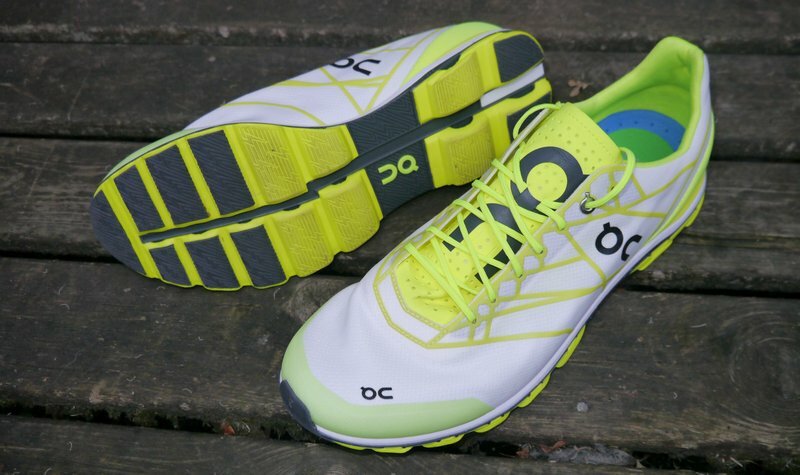 I’ve done a variety of runs in these, from 5k sprints, to a 50 mile ultra. I’ve also tried them on mud, dry trails and road. 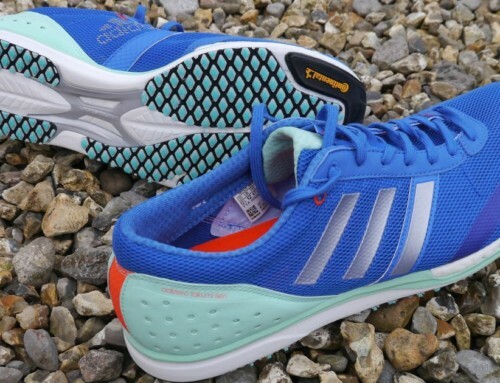 I got them primarily so I’d be prepared for longer runs and races, but in the end, enjoyed them more for faster, shorter runs. In the mud, they grip and grip – job done. You’ll stay upright for sure in these! 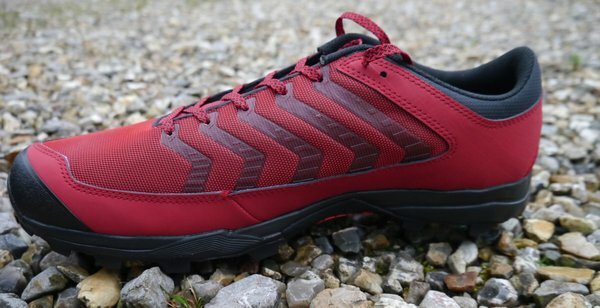 The cushion is perfect for longer distances and for harder trails, but the meta-flex felt fantastic at speed too on mucky parkruns and pinning it to the beach along local water-logged trails with my Husky. Where they fell down was that the upper is not suitable for very long runs. 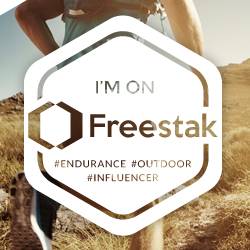 I found this out during the Centurion SDW50 race, a 50 mile trail run along the South Downs Way. 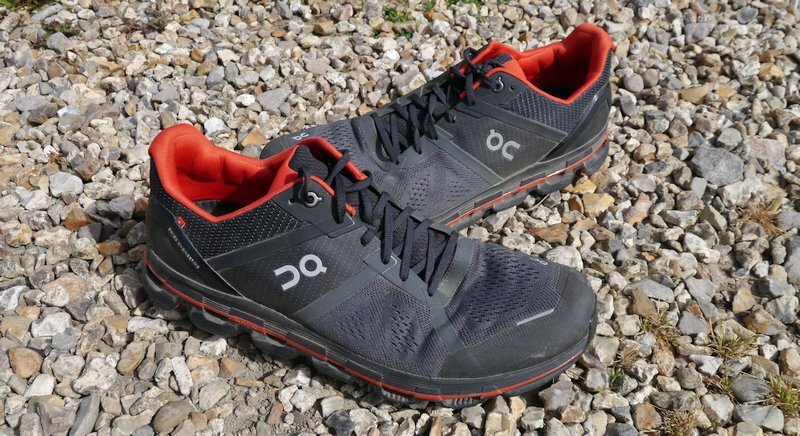 The whole way along, the feeling underfoot was great, but the upper is very stiff along the mesh and the lace eyelets, so the top of my foot got a little sore by the end of my run – not something I’ve experienced in other shoes. I think this is because the mesh doesn’t stretch. I didn’t notice until around 30 miles into the race. 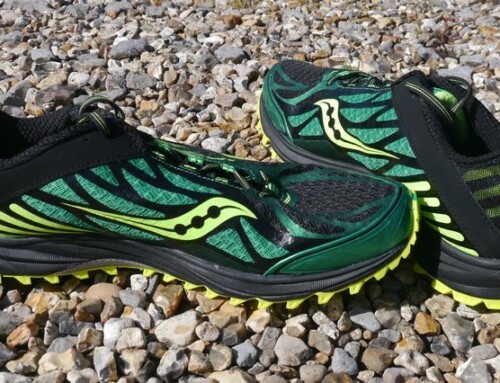 I’ll be using them again for shorter runs when conditions are bad, though because they are a joy to run in for more normal distances. I love the way I can rail around corners and overtake people struggling in lesser grip shoes. I do have a short amount of road to get to my local trails and even when wet, the grippiness of the sole compound was plenty good enough, even though there’s not a lot of rubber to touch the ground on such a hard surface. 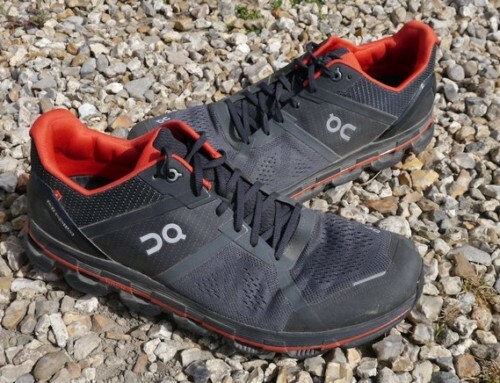 The forefoot has a lovely space for the toes to spread, so running up and downhills is brilliantly composed, giving a sure footing and I was never worried about or troubled by twisted ankles. 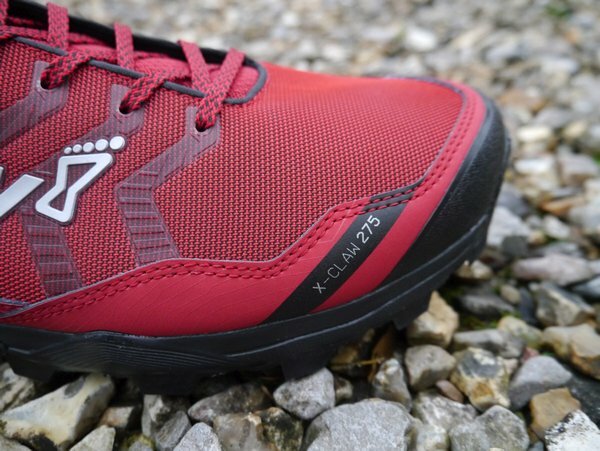 Yes, there are lighter shoes out there, but on flinty or shingle trails, the extra protection is worth it once tired and form is breaking down a bit. I’ve only used them for 130 miles since getting them because we’ve had such dry weather the last year, but any time it gets muddy, they’ll be there waiting for me. I’ve taken a star off because they didn’t work for my idea of “long”, but if you never run that far, you won’t be able to fault these. We aim to provide unbiased feedback that we hope is useful to both manufacturers and consumers alike. Disclosure: we may earn a lead generation commission from purchases made after following links from our site. This does not affect your purchase experience in any way and allows us to keep this site running.